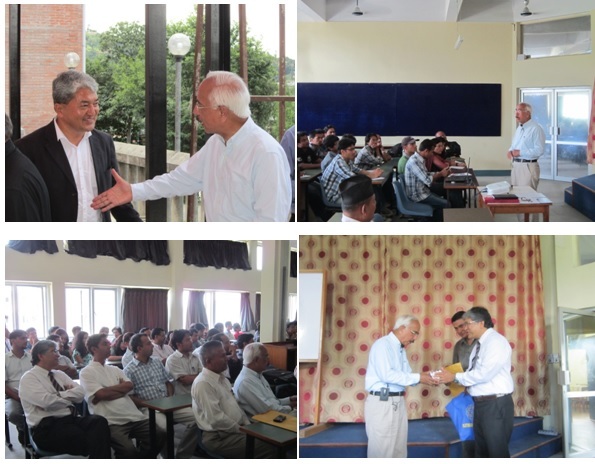 Former Vice-Chancellor of Tribhuvan University, Prof. Dr. Kedar Bhakta Mathema visited Kathmandu University on June 14, 2013 for an interaction event held at mini-auditorium of Dept. of Computer Science and Engineering. Both the students and faculty members from various departments attended the event. During the event, he spoke about his career journey and experience - from being a teaching assistant in Trichandra Campus to becoming the Vice Chancellor of Tribhuvan University and his appointment as the Ambassador to Japan, South Korea, Australia and New Zealand. He also shared several valuable lessons that he has learned from his tenure while serving in different capacities during his career. He credited the importance of hard work, passion, respect for people and perseverance to his successful career. Those in attendance also got an opportunity to interact with the speaker by putting forward several queries before the closing of the event. Kathmandu University Technical Training Center (KUTTC) is an autonomous technical training Centre established to provide skill oriented training programs to under privileged youths. KUTTC will run short-term technical trainings on Automobile, Motorbike, Carpentry, Welding and Machining. TTC invites Expressions of Interest from Kathmandu University's staff (permanent and contract staff) interested and eligible for the post of Instructors. Note: Selected candidates will be given 3 months refresher training on relevant subject in Korea, and will have to work at KUTTC as per KUTTC guidelines. Rt. Hon'ble Chairman of Council of Ministers and Chancellor Mr. Khil Raj Regmi has appointed Prof. Dr. Bhola Thapa as the Registrar of Kathmandu University on 15 June, 2013 for a period of four years. Vice Chancellor Prof. Dr. Ram Kantha Makaju Shrestha had recommended Prof. Thapa for the Registrar of the University as per Kathmandu University Act 1991. Dr. Bhola Thapa is a Professor of Mechanical Engineering and has been serving as the Dean of School of Engineering since 2008. He joined the University in 1994 as a Lecturer. Registrar Prof. Dr. Bhadra Man Tuladhar had submitted his resignation from the post on 13 June, 2013. Dr. Tuladhar is one of the founder member along with other two members of the Kathmandu University. Founder Registrar and Member of the Board of Trustee of Kathmandu University Dr. Sitaram Adhikari has been honoured as Hom-Totra Education Award, 2070. Dr. Suresh Raj Sharma, the Founder Vice-chancellor and Dr. Ramkantha Makaju Shrestha, the present Vice-chancellor of Kathmandu University jointly honoured him at C.V. Raman Auditorium of University on the program conducted by Shabdayatra Prakashan at Jestha 31. In the program, he was also awarded by Subhash Smriti Pratisthan and Chhetri Samaj Nepal. Prevoius year, this award was given to Mrs. Angurbaba Joshi. In the same program, Mr. Ganesh Bahadur Khatri, member of the management committee of Kathmandu Valley Campus, also known as primary form of Kathmandu University, was honoured with Sharada Bal Sahitya Award 2070. Previous year, this award had been given to Mr. Shyam Das Baishnav. Kathmandu University (KU) is an autonomous, not-for-profit institution of higher learning dedicated to maintaining high standards of academic excellence. Pursuing the mission of providing quality education for leadership and leadership in quality education, KU is in the forefront of knowledge industry in the fields of science, engineering, management, education, arts and humanities, and medical sciences. KU is looking for committed, competent, and qualified Nepali professionals to take up permanent non teaching positions in its Central Office and Schools. The Job Description, Minimum Qualifications Required and Other Requirements are available link Below. Potential candidates will require completing an application form available from June 18, 2013 on payment of Rs. 500 from Kathmandu University Central Office, Dhulikhel (Tel # 011 66 13 99/ 011 66 15 11) from 10 AM to 3 PM on working days. Application form can also be downloaded from KU webpage. The completed application form must be submitted along with necessary documents not later than July 8, 2013 to KU Central Office, Dhulikhel, Kavre. The shortlisted candidate must make a payment of cognitive and performance test and interview fee of Rs 1200 for Manager, and Rs.1000 for Support staff at the time of collecting admit card. KU provides good career opportunities for high performing staff. Only short-listed candidates will be contacted for further selection process as per the KU selection guidelines. Kathmandu University in Collaboration with Technion-Israel Institute of Technology is conducting an International Summer Course 2013 entitled ‘Engineering for Developing Communities’ under UNESCO UNITWIN Program. This is a 2.5 ABET course focusing on the theory and field knowledge with the core idea on Bio-Gas, Improved Cooking Stoves, Solar PV, Improved Water Mills, Rain Water Harvesting and Hydraulic Pump. Note: Admissions decision will be based on evaluating the application of each candidate with emphasis placed on academic performance. Mathema born in November 25, 1945, started his career from the educational sector as a Founder/Head teacher at Gyanodaya Adult High School, a non-profit making school. He served as a lecturer at Tri-Chandra College and College of Education; as a Head of Language Department at Institute of Education, Tribhuvan University and as Campus Chief, Central Campus of Tribhuvan University. He also worked as Senior Program Officer of World Bank Resident Mission in Kathmandu (1975), as Vice-chancellor of Tribhuwan University (1991), Chairman of High level task force on issues related to youth (1996). He represented Nepal during 1996-2003 as Ambassador to Japan, South Korea, Australia and New Zealand. Returning back to Nepal, he acted as a member of High Level Task Force to review Nepal’s foreign policy, and currently is involved in various organizations – Senate (Purbanchal University), Member of Senate (National Academy of Medical Science), Advisor (Maiti Nepal), Member of Governing Council (Madan Puraskar Pustakalaya). Gorkha Dakshin Bahu (Second Class), Honorary Doctor of Letters (Soka University, Japan), Hem Bahadur Malla Award (Public Administration Association of Nepal, 2004), are some of the recognitions he is conferred with. He is the patron of School of Creative Communications (SCC). The Following eight teams qualified for the quarter final in 1st Inter University T-20 Tournament 2013 based on the points and Net Run Rate they secured during the league matches. 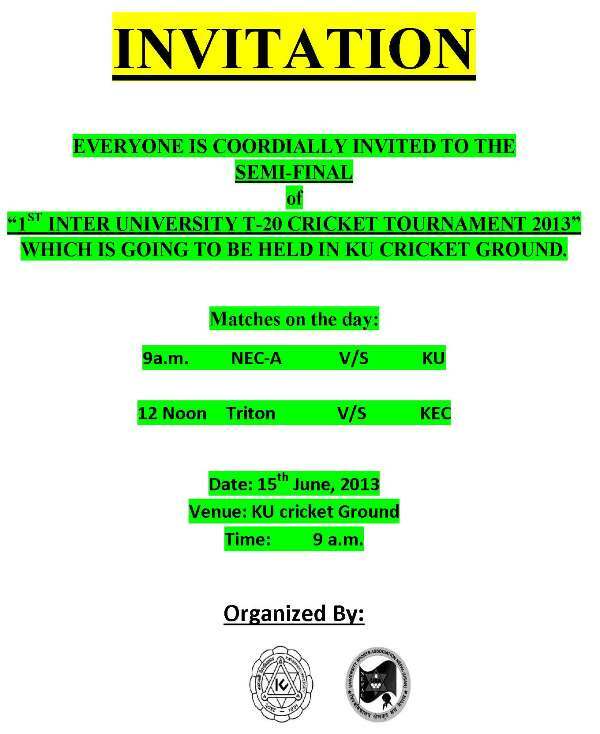 Note: The qualified teams will be informed about their schedule beforehand. 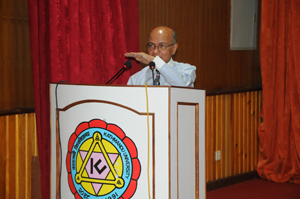 On June 9, 2013 Mr. Kul Chandra Gautam and Prayas Rajopadhyay gave presentations in CV Raman Hall from 1.00 PM to 3.00 PM with a focus to Management students at KU. Kul Chandra Gautam spoke about his personal journey from Gulmi to United Nation and Virtues and Vices in today’s Nepal. He emphasized various positive things that have happened in Nepal including greater level of awareness and communication and energy, inertia and activism at the grass root levels in villages in Nepal. He is a distinguished international civil servant, development professional, public policy expert, and human rights activist. Previously he was Deputy Executive Director of UNICEF and Assistant Secretary-General of the United Nations. He has extensive experience in international diplomacy, development cooperation and humanitarian assistance. Prayas Rajopadhyay a young entrepreneur, a recent graduate talked about how to go about starting a new enterprise and its elements. Student presentations were given by Abhilasha Bhuju and Jitendra Shah. The program was organized by members of Engineering faculty Arun Sharma and Bibhu Tuladhar. Arun Sharma gave a presentation on critical importance of quality in enhancing standard and needed commitment. Vote of thanks and closing remarks were given by Dean, School of Engineering Dr. Bhola Thapa. Data analysis and statistical interpretation using computer software. From: July 1, 2013 to July 5, 2013. Session I: Theory 10:00 A.M. – 1:00 P.M. Session II: Practical 2:00 P.M. –3:30 P.M.
We are building foundations of data analysis and statistical interpretation using computer software. Each class provides an in-depth look at a particular topic or set of topics related to data analysis, data modeling, statistics and probability. Students will learn through practical applications, and are welcome and encouraged to use challenges from their own research problem as learning tools during class discussions. Valuable tips and insights needed for the analysis of research data with the help of computer software will be given. A detailed manual illustrating all the steps will also be provided. Course Outline: This course gives an overview of various statistical tools used in descriptive and inferential statistics with the help of computer software. The students will be geared to deal with research problems ranging from effective collection and presentation of data to efficient and accurate analysis and interpretation. Design of experiments, correlation, regression and hypothesis testing are important constituent of research methodology. These along with several other topics will be dealt in detail. The students will also have an orientation on data analysis with the help of computer software such as SPSS and spread sheets such EXCEL, especially designed for statistical analysis. A detailed manual illustrating all the steps of statistical analysis and its correct interpretation will also be provided. Register as soon as Possible!! Only limited seats Available!! Confirm your seats through the e-mail <drjdevkota@ku.edu.np> or <devkotajb@yahoo.com>. Last Date for the submission of fee is 20 June 2013. Delay in the submission of the fee will lead to cancellation of the seat. 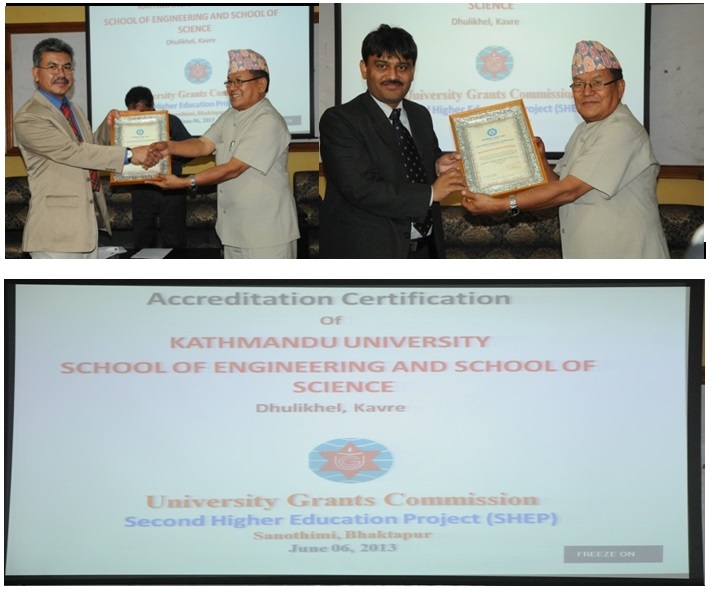 University Grants Commission (UGC) awarded Accreditation Certification to School of Science (SOS) and School of Engineering (SOE) of Kathmandu University in a program organized by UGC at Sanothimi, Bhaktapur. UGC has been taking initiation for Quality Assurance and Accreditation (QAA) system that insures institution's quality of higher education that fulfill the set of criteria not only at institutional level but also in their academic programs to offer better results to the society. Very recently, a Peer Review Team has visited at the University and reviewed the programs running under the SOS and SOE, asking numerous questions to the concern stakeholders in their 5 days long intensive visit. On behalf of the University, Vice Chancellor Prof. Dr. Ram Kantha Makaju Shrestha, Registrar Prof. Dr. Bhadra Man Tuladhar, Deans Prof. Dr. Panna Thapa, and Prof. Dr. Bhola Thapa, members of Self Assessment Team, faculties and staffs were also present on the occasion. Prof. Dr. Ganesh Man Gurung, Chairman of UGC, presented certificate to the Deans of School of Science and School of Engineering, Kathmandu University. ul Chandra Gautam is a distinguished international civil servant, public policy expert and peace advocate. He served as Assistant Secretary General of the UN and Deputy Executive Director of UNICEF. 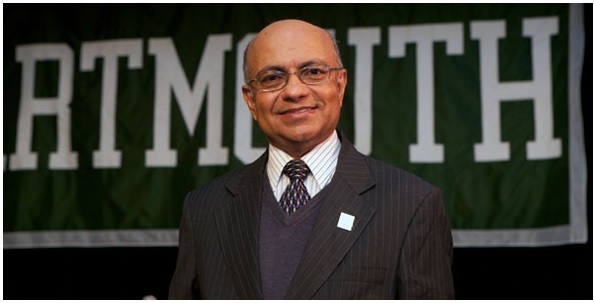 Mr. Gautam’s career at UNICEF spanned the Child Survival Revolution; he was the key UNICEF staff member responsible for preparing the draft Declaration and Plan of Action for the World Summit for Children in 1990. He was also Special Advisor to the Prime Minister of Nepal on International Affairs and the Peace Process. He is a seasoned diplomat and civic leader and serves on the Boards of a number of international and national foundations and charitable organizations as chairman, member or advisor.